Explanation: Hitching a ride to low Earth orbit, LightSail A accomplished a challenging test mission, unfurling its 32 square metre mylar solar sail on June 7. 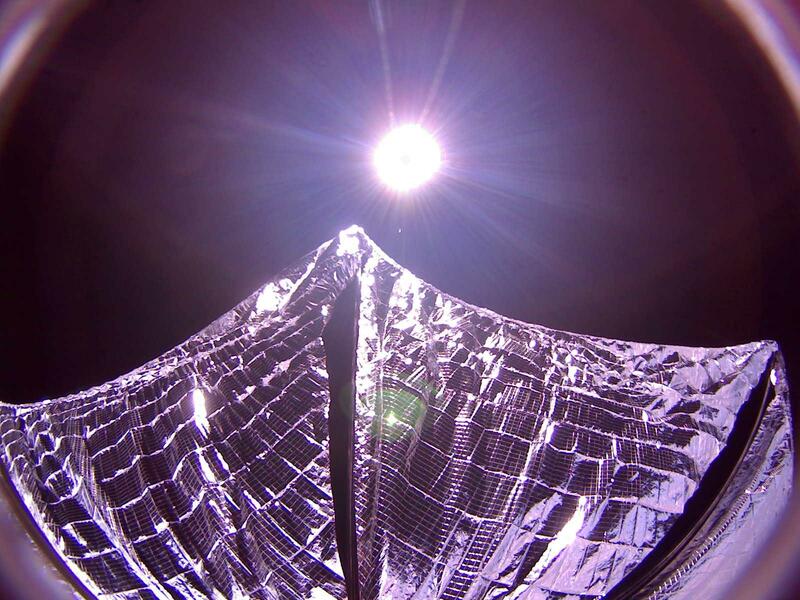 This dramatic image from one of the bread loaf sized spacecraft's fisheye cameras captures the deployed sail glinting in sunlight. Sail out and visible to Earthbound observers before its final orbit, LightSail A reentered the atmosphere last weekend. Its succesful technology demonstration paves the way for the LightSail B spacecraft, scheduled for launch in April 2016. Once considered the stuff of science fiction, sailing through space was suggested 400 years ago by astronomer Johannes Kepler who observed comet tails blown by the solar wind. But modern solar sail designs, like the one tested by LightSail A, rely on the small but continuous pressure from sunlight itself for thrust.